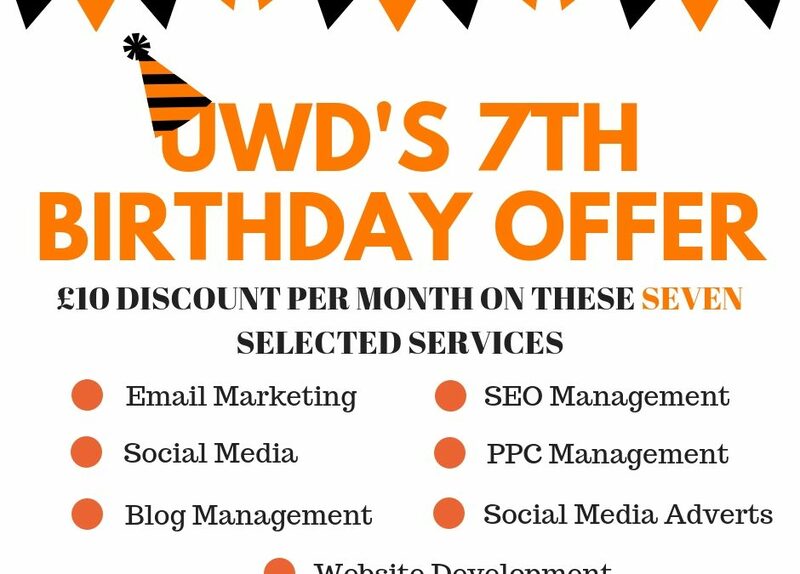 UWD’s Special Birthday Offer On SEVEN Selected Services! 7th year of business this month! With this in mind, we feel like making the most of it all and carrying on the celebration for THE WHOLE OF NOVEMBER! You didn’t think we’d leave you out on the celebrations did you?! We’d like to offer our new and existing clients £10 off per month on SEVEN selected service packages, courtesy of the in-house team at Universal. So what can you expect to receive your £10 per month discount on, I hear you ask? Social Media Adverts enable growth through the art of advertising on your online platforms added into the mix. Your Social Media Manager will be working hard to boost your engagement, as well as targeting a more specific audience, Social Media Advertising packages are ideal! Social Media Management is massive, truly massive. With our packages, you will have your very own dedicated Social Media manager who is there to cater for your every night in the online marketing world. Whether you are looking to hand over the management to our Social Media Expert or need some help venturing into this new, exciting world… our packages are perfect for you and your business on Twitter, Facebook, Linkedin and Instagram. A blog can be your company’s voice in a crowded room of market saturation and over population. Where we’ll make sure that your business is shouting louder than everybody else. We will populate your blog with only the most relevant, the most interesting of content. We thoroughly research your specific field of industry, so that we can bring your customers what they want, when they want it. The Bronze search engine optimisation is designed to help small businesses and sole traders be found online. It’s likely that your website is not currently performing as it should and our SEO packages will enhance your websites ranking so it gains the exposure that your business needs through keywords, keyword groups and tracking. Per-per-click is advertising on the google search engine, with you only paying for each click, and setting a budget, this ensures that it is only as expensive as you make it. Our Pay Per Click expert manages the campaign, improves relevance and helps to maximise conversions as well as lower the cost per click. These carefully selected services are able to transform and provide a unique online presence that many businesses are benefiting from the variety of Bronze, Silver, Gold, Platinum and Platinum+ packages we offer into each of these services – now it’s your turn! If you would like to find out more about our SEVEN service special offers, please get in contact with the team here at Universal Web Design on 01206 588 000 or email sales@universalwebdesign.co.uk for more information. Join in and take advantage of UWD’s 7th Birthday!